LOS ANGELES, CA (February 12, 2018) – BOOM! Studios today announced HEX VET: THE FLYING SURGERY, the next softcover original graphic novel about witches-in-training Nan and Clarion, from cartoonist Sam Davies (Stutterhug), which will debut in stores December 2019. It’s time for the monthly “Winged Creature Clinic” at Willows Whisper Veterinary Practice, where flying creatures from all over come to get treated. But when Glenn the Wildlife Warlock brings in an injured flying pig that looks like it may have been mistreated, panic strikes and a greater mystery unfolds. It’s up to everyone’s favorite witches-in-training, Nan and Clarion, to keep everything under control at the chaotic clinic while Dr. Talon is away. Will Nan and Clarion save the day and keep their jobs? Or are their days at Willows Whisper numbered? Sam Davies is the creator of the beloved silent webcomics Stutterhug and The Shape of Things, as well as original graphic novel Hex Vet: Witches in Trainingfrom BOOM! Studios. HEX VET: THE FLYING SURGERY is the latest release from BOOM! Studios’ award-winning KaBOOM! imprint, home to comics for middle grade and younger readers including licensed series such as Adventure Time, Steven Universe, Regular Show, Ben 10, and Over The Garden Wall, along with original series like Pandora’s Legacy by Kara Leopard, Kelly & Nichole Matthews, RuinWorld by Derek Laufman, and The Deep by Tom Taylor and James Brouwer. 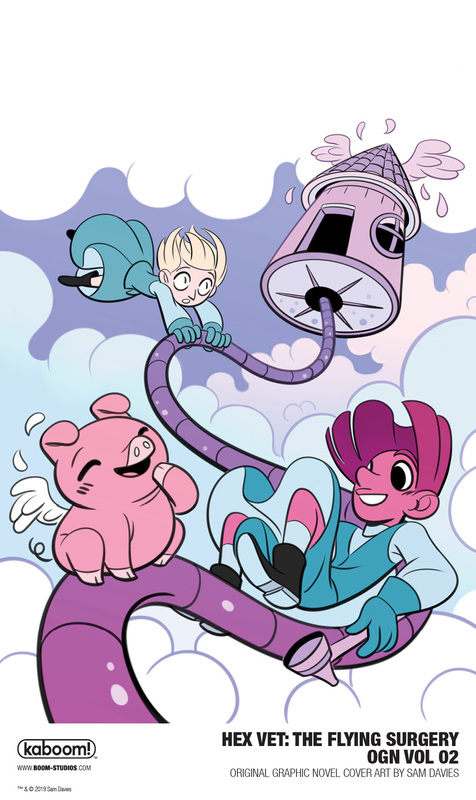 Print copies of HEX VET: THE FLYING SURGERY will be available for sale in December 2019 at local comic book shops (use comicshoplocator.com to find the nearest one), bookstores or at the BOOM! Studios webstore. Digital copies can be purchased from content providers, including comiXology, iBooks, Google Play, and the BOOM! Studios app. For more on HEX VET: THE FLYING SURGERY and other projects from BOOM! Studios, stay tuned to www.boom-studios.com and follow @boomstudios on Twitter. DOMINO Takes The Spotlight with a New Series by Gail Simone!